When I was growing up, my neighbor had some beautiful old plum trees that he tended to like they were babies. He meticulously shaped and pruned them, and although I was a kid, the fruit was so plump, sweet, juicy and plentiful (yes, we regularly filched them), I couldn’t argue the logic of all his labor. So, why is plum fruit thinning a necessary part of maintaining the trees overall health and just how does one correctly thin plum trees? If you want to promote ample fruit set each year, thinning plum trees is imperative. There are three reasons for plum fruit thinning. The tree will bear larger, sweeter and juicier plums if there are fewer on the tree maturing. Secondly, the enormous weight of too many ripening plums often causes the branches to crack, opening them up to silver leaf disease. Lastly, sometimes plum trees only fruit biennially instead of every year. 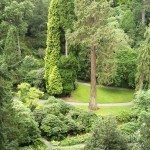 This is due to the fact that the tree has produced such a copious crop that it’s just plain done and needs an extra season to gather its resources before it can fruit again. Thinning the plum eliminates this problem and promotes annual fruit set. During the first two to three years, young trees should be trained to develop a branching system or tree canopy able to support the fruit crop and makes it easier to harvest too. Additionally, it creates an aerated space with as much sunlight penetration as possible. Large fruit is the direct result of strong flower buds that have been grown in full sunlight. Thereafter, adult trees from 3-10 years are pruned when they are dormant from December to February and during May to August. Now that we know when, the question is how to thin plum trees. First year dormant pruning can be approached as creating either an open center of modified central leader system. In an open center system, exterior lateral branches are selected and the interior branches are pruned out. Sometimes spreader sticks and branch weights are used to widen the branch angles of the plum scaffold branches. 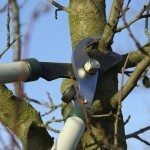 If using a modified central leader system, prune all branches to about twelve inches from the trunk of the tree. The resulting new growth will force some exterior branches to grow laterally and the dense interior branches can be pruned out later. At the end of May, gradually begin removing some of the immature fruit clusters. This increases the leaf to fruit ratio and removes smaller fruit that would never attain a greater size or quality and, in turn, increase the size of the remaining fruit. Then in July when the fruit is still hard, thin out the plums that are damaged, bruised or diseased as well as those that are too close together. In a perfect world, you should leave around 3 inches between plums. A final method for thinning plums is interesting. Apparently, you can bang the unripe plums off. 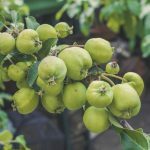 Use a 4-foot length of flexible ½-inch PVC pipe or a broom handle with 1-2 feet of garden hose on the end and hit the limbs laden with unripe plums lightly, increasing your force until the unripe plums cascade down. The theory being that once the majority of the small, unripe plums are brought down, the rest will gain in size and ripen more evenly as they mature. As I said, interesting.